Home / 30hands Getting Started Course & Help Site / 2. Let’s Create a Digital Story! 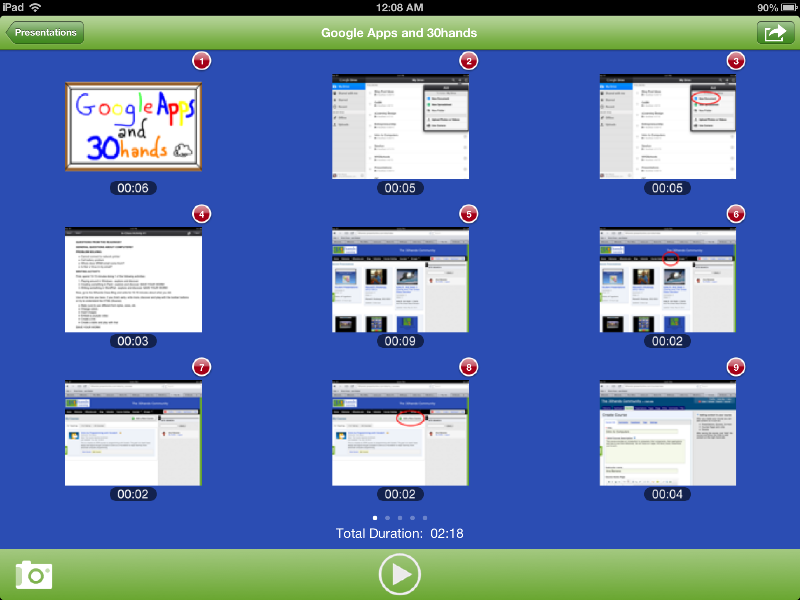 30hands mobile helps students and teachers develop iterative creativity (tm). The reason we focus on iteration is that it takes learning to a higher level. We all know that a first draft is never the best result of creative efforts. That’s why teachers usually incorporate multiple draft submissions into longer writing assignments. Iteration takes on multiple forms. It includes review and revision, editing and practice. In addition, peer review and discussion can be a valuable part of the iterative process. Select 5 photos from the random images and download them to your iPad or iPhone. We recommend putting the images into an album on your device. Create a new presentation in 30hands Mobile Free or 30hands Mobile Pro, and add the 5 images. Look at the photos and think about how they could fit together into a story. Rearrange the slides on the desktop in the order of your story. Write a script for your story on paper, on a computer or on your device. Number the parts of the script to correspond to the images. Record your story, one slide at a time. Review the story. If the narration on a single slide is too long, think about how you can break it into multiple slides. This may include inserting additional images or annotating the existing images. Note: If you annotate an image and save it, a copy will be created in the camera roll, so you can use both the original and annotated images. Revise you story by modifying your script, inserting images, annotating images and rearranging slides. After reviewing your changes, see how you can make each slide and the overall story more concise, faster paced and more interesting. Try some vocal variations and character voices for fun. When finished, publish your story to your camera roll or, if you are proud of your accomplishment, publish it to 30hands to show the world! Note: While publishing to 30hands, do not exit the app, or the publish process will be disrupted. We hope you’ve had fun iteratively creating a story from random photos and images. This could be a project to do with your students. Let us know what you think of this project by emailing us at info@30hands.com or by commenting on your published video on the 30hands community site. We love feedback! 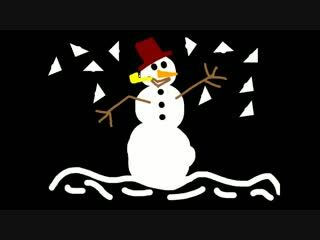 A slide from the The Season for Snowmen. Create stop-motion video by drawing or annotating slides in a progressive series. Touch the Record Button off and on quickly to set a short slide duration. Publish the video to the Camera Roll and open it in iMovie to add background music.